Consisting of that part of Washington west of the Cascades and south of the Olympic and Kitsap Peninsulas and Seattle/King County, Southwest Washington is well populated only along the I-5 corridor. Vancouver is the oldest city in the region and the trails north to Puget Sound anticipated the later routes of Highway 99 and Interstate 5. To the east and west of this corridor, Southwest Washington is dominated by forests of Douglas fir. 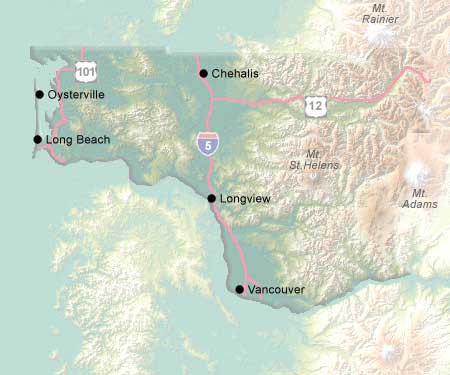 Several communities line the Long Beach Peninsula, such as Long Beach and Oysterville. The Washington side of the Columbia is less traveled than the Oregon side below Longview, with a few river towns like Skamokawa and Cathlamet downstream. Upstream from Vancouver, the settlements are scattered. The major natural feature is Mount St Helens.